It’s funny that people want the beacon mode to be brighter. I find it way too bright. Maybe it can use the memorized ramp level instead. That’s an easy change. There is, um, probably a bit too much info packed into each graph… but I think what it shows is pretty close to what I measured on actual hardware. So it seems like a fair model for testing changes without waiting an hour for each test. Loosen + tighten tailcap, then click: Go to maximum 7135 level (~140 lm with no PWM and no FET). I implemented those two UIs in 2014 in the “Ferrero Rocher” project. They’re called Ramping_UI_table.c and Baton.c in the firmware repository. I plan to make updated versions for the D4, but it won’t be part of the production run. They’re example UIs or test cases for a new generic code base. Jay, the 100%7135 is back! I love the work you do on the D4 Toykeeper! Do you think Hank will have any replacement switches and boots, mainly switches, drivers would be great also, thank you..
Oh, good news, thanks you. Such UI is much more convenient. So is there any chanc that Hank will sell the D4 with YOUR firmware on intl outdoor ? The idea as I understand is that what Toykeeper is developing now is to be in the D4’s that Hank is going to sell on intl-outdoor. The improvements made by TK to the firmware will make the D4 a really good flashlight for sure ! Mode memory is not saved across battery changes. This means it needs a default value. The default could be moon, 10 lm, level 65 (100% on 7135 chip, 0% on FET), or something else. I’m thinking the 100% 7135 mode might be a good default, since it’d be nice to have a shortcut to the highest regulated level with no PWM. I measured it at 133 lm on mine. This level would be accessible at any time by loosening the tailcap, tightening it again, then clicking the button once. However, 10 lm might be nice too. 1) It is a very symbolic value that portrays the essence of the light and driver; a true flashaholic should/could understand and appreciate the meaning of this output. 2) ramping to a comfortable 600-ish lumen output is much faster from single click level65, than it is from single click 10 lumen output. Edit: percentage wise it’s faster. I vote for 133 lm level65 as default. Efficiency vs. output curve is nearly flat, then falls of the cliff and is again nearly flat. 350 mA is the cliff top. It should be easily reachable. But it should be also easy to tell on which side of the cliff the flashlight is at any given mode. Otherwise there will be nasty surprises of battery draining much faster than it should. Making 350 mA the default level is a great way of making it easily reachable. However, ramping from low, one can easily pass it without noticing. I don’t like it and I think it should be somehow communicated to the user. I think you’re doing a fantastic job on this TK, taking it to the next level with your simulations and total expertise. You know, of course, that when the dust settles on this and you’ve got it where you want it I’m going to HAVE to get a green one, right? I did not say that I don’t like you work TK, just this aspect of UI. It was meant as a discussion-opener really, though the topic was meant to be slightly different than what DB Custom stated. I did not say that I like it either. Now I do: Thank you for your great work! I’m glad I waited, thanks TK! 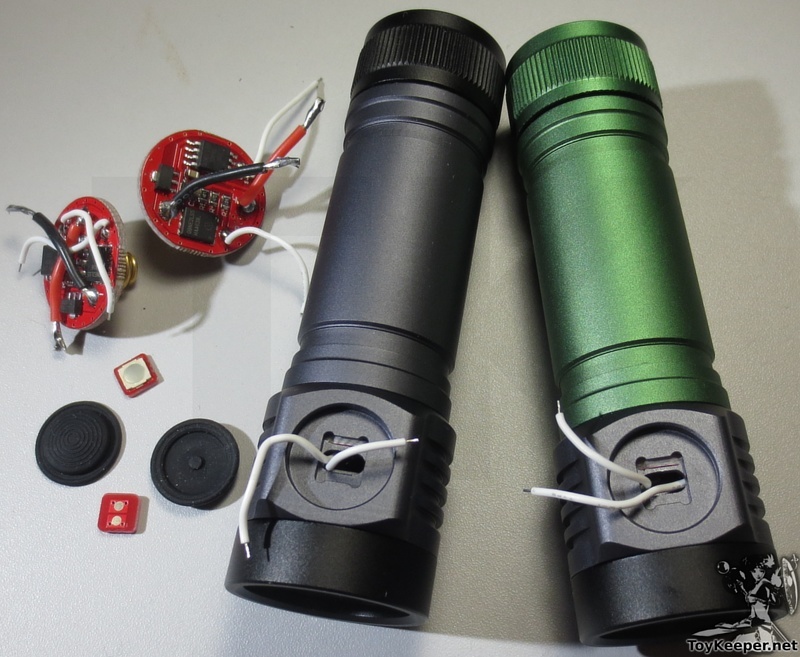 I’ve been deciding between the Manker E14 II and Astorlux S41, so this looks interesting, wondering roughly when the revised versions will be available. Also signed up for the TLF/BLF FW3A xpg3 triple, somewhat similar but triple w/tail switch. The FW3A is much different in that the tail switch is an electronic switch, not an easy feat to accomplish. The FW3A also has that “direct from the lathe” look and feel. Two fairly different lights that I will likely end up owning far too many of. Any info when this will be available directly from Intl? Yes it will self activate in your pocket and my advise is to Always either head or tail lock it, man I have a huge burn right next to my .. well it was really a worrisome place to see the light and on full blast, now have a nice big red looking burn I think, but darn tender for sure, just a FYI if pocket light user or purse even I’d suspect, it doesn’t take a lot of force to activate the switch. Only thing I know for sure is lock it out always, great idea, and that my experience could have been way worse than it was, only a few more inches or less to the East and I would have had severally roasted, Edit: and save a rude probably. …. when are the new D4s with Toykeeper’s driver tweeks going to be available? Will MtnElectronics also sell the version with the tweaked driver? Well, I haven’t finished the code yet… so not until that’s done. But hopefully within a few days? I think RMM is planning to update his stock too, because, as T18 discovered, the thermal regulation really needs some updates for safety. … For the sake of avoiding posts about… roasted… well you know. Raised button – the button sticks up above the casing of the light. Easy to find the button, but also very easy to accidentally activate. Takes up very little space inside the light. Flush button – Button is at the same level as the casing. Accidental activation is less likely than with a raised button, but the button can sometimes be hard to quickly find. Recessed button – Button is recessed below the level of the casing. least likely to suffer accidental activation as the raised sides of the light tend to keep things like the sides of your pants away from the button. A deeply recessed button can be easier to find than a flush button as it acts like a funnel for the thumb. This is probably the best option for a pocket EDC light as it offers the most protection from accidental activation, while still having the convenience of instant access with no lockout. Downside of this type is it may take more space inside the light. This is one lesson Zebralight learned. stiffer switch. The button is still easy to press, but requires more pressure than the original SC51 switch. deeply recessed switch. The high sides of the casing surrounding the button makes accidental activation very unlikely. Tailcap lockout is no longer necessary. 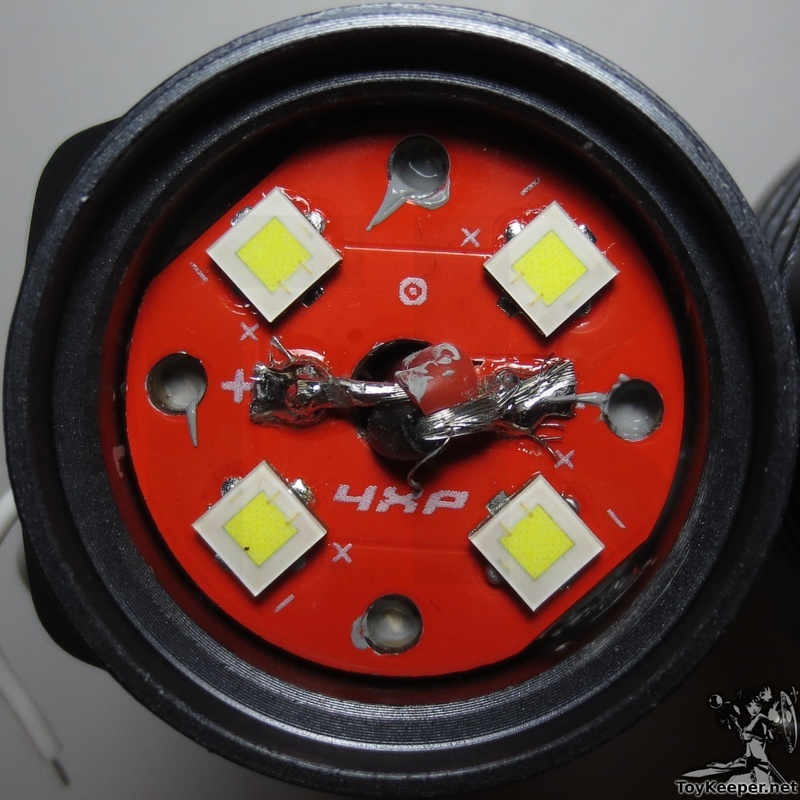 For the D4: From looking at the disassembly of the light, the simplest hardware solution to solve the problem of accidental activation would be to replace the bare-metal retaining ring over the rubber switchboot with one that has high sides that project above the level of the light by several mm. With this proposed new retaining ring, the sides of the retaining ring would tend to come into contact with your pants before the button making accidental activation much less likely. 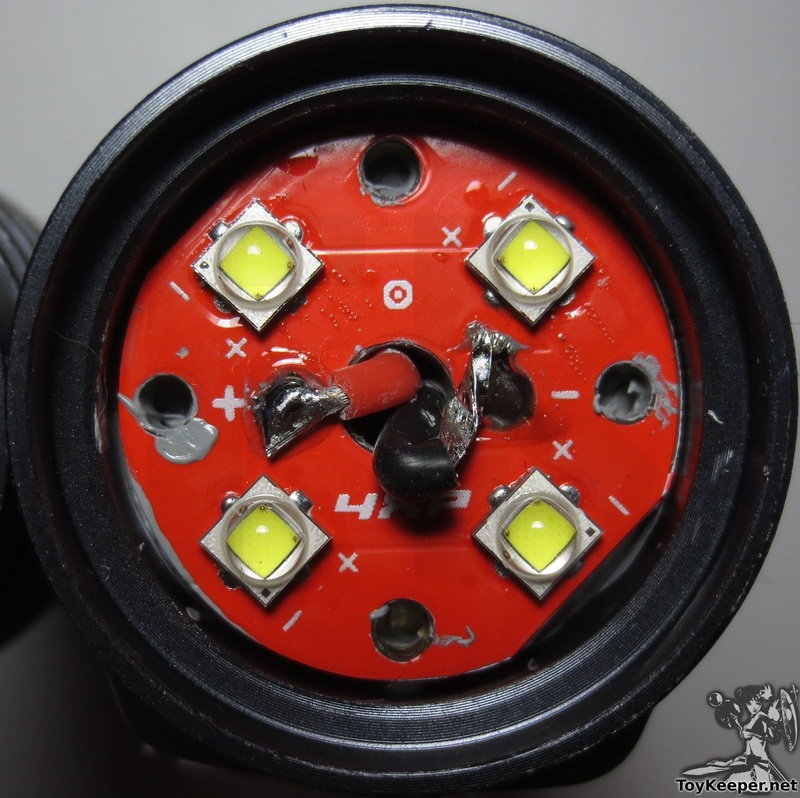 Replacing the Emisar D4’s retaining ring with a raised one is a good solution as it would only require replacement of 1 part and would effective convert the light from a “raised button” to a “recessed button”. Also, the XP-L HI melted my ND4 filter. Dangit. That’s okay though; it still works for my purposes. Will XPL2 emitters fit under an unmodified Carclo quad optic? If so, what would be the output with them Toykeeper? Nope (IIRC), and no clue. But there are reasons people aren’t using XP-L2 in flashlights. I hear the beam is pretty terrible. I’m surprised the output was so high with the XP-L HI. I figured its higher forward voltage would limit it to about the same as the 219C.